Bahraini police fired tear gas and rubber bullets at protesters marching toward the landmark Pearl Square in the country’s capital Friday, eyewitnesses said, just two days after authorities lifted emergency rule in the Gulf kingdom. The downtown square was the epicenter of weeks of Shiite-led protests against Sunni rulers earlier this year. There were no immediate reports of injuries during the protests. The eyewitnesses spoke on condition of anonymity, fearing reprisals. The Bahraini government lifted emergency rule Wednesday. Tanks and soldiers left the heart of capital, but authorities warned they were not easing pressure on anti-government protesters as opposition groups called on its supporters to return to the streets. That was the first such appeal since the military overran the protesters’ encampment at Pearl Square after martial law was imposed in mid-March. At least 30 people have been killed since the protests for more rights and freedoms began in February in the Western-allied island nation, which hosts the U.S. Navy’s 5th Fleet. The protests were inspired by revolts across the Arab world. Bahrain’s Sunni rulers invited 1,500 troops from a Saudi-led Gulf force to help suppress the unrest when emergency rule was declared. The Saudi intervention infuriated Shiite power Iran. It underscored the fears of Iran among Sunni-dominated Arab countries, particularly among Gulf Arab leaders who fear that gains by Bahrain’s Shiites could provide an opening for Iran to expand its influence on the doorstep of rival Saudi Arabia. Despite tight security across Bahrain and police reinforcements at numerous checkpoints around the capital, hundreds of opposition supporters from the mostly Shiite populated villages around Manama took their grievances to the streets again and set off to reclaim Pearl Square. 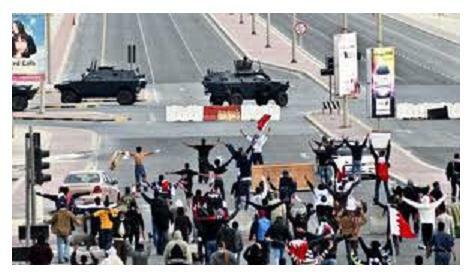 The emergency rule gave the military wide powers to suppress demonstrations led by the country’s Shiite majority against the minority Sunni monarchy that has ruled Bahrain for over 200 years. Hundreds of protesters, political leaders and Shiite professionals like doctors and lawyers have been arrested and tried in a special security court, set up under martial law. Two protesters were sentenced to death.